See the Society's policies and procedures for checking out library materials by selecting from the menu below. Items checked out with a Society library card are on loan for 28 days. Some University of Wisconsin students and employees are eligible for a longer borrowing period. Many books, bound periodicals, microforms and government publications may be checked out for home use with a library card. Rare, fragile, small (under 50 pages) and heavily used materials (including genealogical resources) do not circulate. All materials including pamphlets, unbound periodicals and microforms, may be used within the Library without a borrowing card. Check out books, pamphlets, microfilm, government publications and bound periodicals at the Library Circulation Desk. Visitors who are not residents of Wisconsin nor current UW System students or employees are not eligible to borrow materials in person. However, any item that circulates from the Library may be loaned to a patron of another library through interlibrary loan. University of Wisconsin students and employees may borrow Library materials in person with a UW System photo ID card. The most versatile library card for Wisconsin Residents is the borrowing card issued by UW-Madison's Memorial Library. 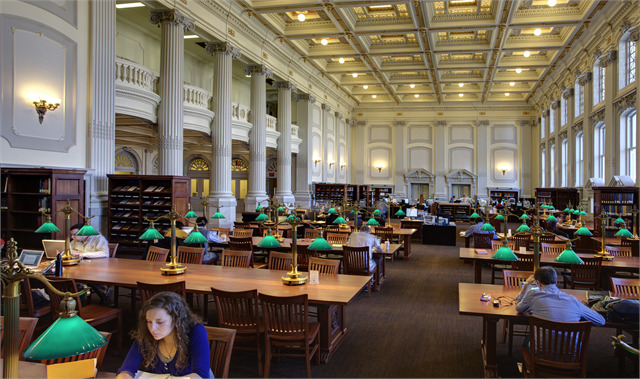 For $40 per year, you can borrow materials from both the UW-Madison libraries and the Wisconsin Historical Society. Wisconsin Residents can sign up for a free Society Library card at the Society's Library Circulation Desk. Signing up takes about five minutes and requires both photo ID and proof of current Wisconsin address (driver's license, state ID, checkbook, utility bill or lease). Society library cards are only valid for borrowing Society Library materials, expire annually on June 30 and must be renewed in person. Borrowers with overdue materials will be notified one business day after the item's due date by postal mail or email. Each borrower is responsible for keeping the Library notified of his or her current postal and/or email address. If an item reaches 14 days overdue, the borrower will receive a second notification. If a loan reaches 28 days overdue, the borrower will be billed $95 per item ($80 replacement charge + $15 late fine). Additional charges may be assessed on items returned with damage. Items on course reserve are fined by the hour or day, depending on the loan period. Most materials are subject to recall by another borrower. Materials borrowed on course reserve can't be recalled. If one of your items is recalled, you'll be notified of the new due date by U.S. mail or email. You'll have at least 14 days from the original checkout date to use the item. Your borrowing privileges will be suspended if you do not return a recalled item by its new due date. Items can often be renewed online by signing into your MadCat account or by calling 608-264-6534. If you are a Society Library cardholder, enter your card's barcode number (11 digits) in place of the UW-Madison ID number. To avoid fines, please renew your materials within 28 days of the due date.